The L-Tron Team would like to wish everyone a safe and happy 4th of July! Instead of simply a “grazing” day, L-Tron celebrated the 4th of July with a “grazing” week. 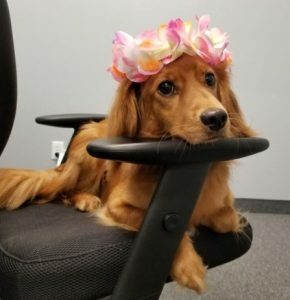 The team celebrated the short week and America’s birthday with a cookout on Tuesday, and Hawaii Day on Friday (with lots of other snacks in-between). On Tuesday, most of the team wore their red, white and blue. Cathy even had a patriotic shirt for each day of the week! The LTC team pictched in to bring in plenty of snacks and sweet treats. 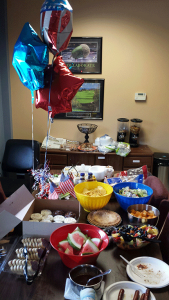 Ken brought in american flag cookies, Elyse shared a veggie tray and Juli contributed a fruit salad. All the snacks put everyone in the right state of mind to celebrate the holiday on Wednesday. We also celebrated National Chocolate Day (just a day early). Viet brought in Watson’s chocolates, Alex brought in mini-cupcakes and RAD brought in chocolate ice pops for everyone. RAD also cooked up some chicken breasts on the NEW L-Tron grill (completely unrelated to chocolate or Hawaii). All in all, it was a great week for the team and a nice way to start the month of July. Happy 4th of July from the L-Tron Team! Did you have a happy 4th of July week? Share your best memories with us on social media @LTronCorp.